This tour offers you a unique glimpse into the authentic Mexican lifestyle, and the rich cultural heritage of Puerto Vallarta and company of its warm, friendly people. While driving your scooter along the picturesque Bay of Banderas, you will partake of some of the most colorful scenery in Jalisco. You will have plenty of time to take photos of the breathtaking, endless beaches on the south side of Puerto Vallarta, and of the ecological bird sanctuary, Los Arcos. 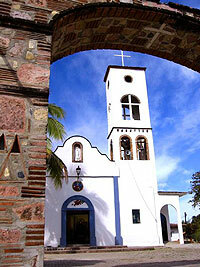 From there, you'll venture into the inspiring, natural surroundings of the Sierra Madre Mountains. The lush and colorful drive makes this an unforgettable adventure. We'll arrive at the hidden traditional Village of El Tuito, known for the unusual uniformity of its buildings, and painted with a mixture of local clay that gives the walls a unique orange color. The name El Tuito is derived from the ancient Nahuatal Language spoken by the Aztecs and means, ''Little Beautiful Valley''. Here you can explore the main plaza, where many of the original homes have been restored and converted into museums, and the Cultural Center, where local artists have open studios. A visit to El Tuito would not be complete without tasting the Panela fresh cheese, home made by a local women at her Cremeria Dona Coco. This tour is a true hidden gem and will take you to the heart of Mexican culture that is seldom explored when visiting Puerto Vallarta. Runs: Monday through Saturday at 9:30 AM. We can do tours on Sunday for groups of 4 or more however. Notes: Drivers must be able to safely operate the scooter. If you have trouble with the scooter, 4-wheel ATV can be substituted for your safety when available (additional fuel surcharge will apply). Weight limit is 310 lbs (140 kg) per scooter.